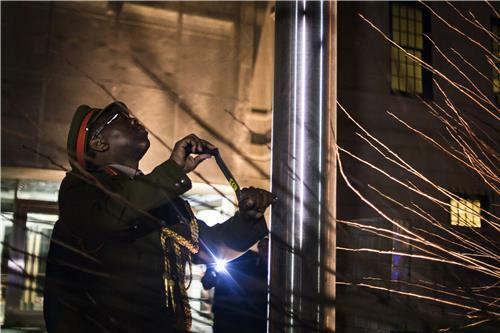 From sweaty nightclubs in the sprawling township of Soweto to the heart of Johannesburg's Sandton financial district, DJs hit the pause button as party-goers stood in stunned silence to listen to Zuma's nationally televised address. For most, the passing of South Africa's first black president was an unforgettable moment in history. 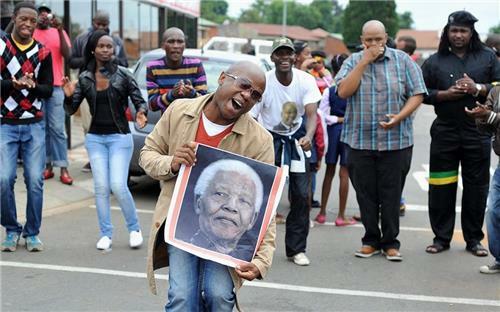 "As soon as we saw Zuma on TV, the music stopped and everyone rushed to watch the TV, to listen to what was happening," said 19-year-old school leaver Lesego Tsimo outside a Soweto nightclub. 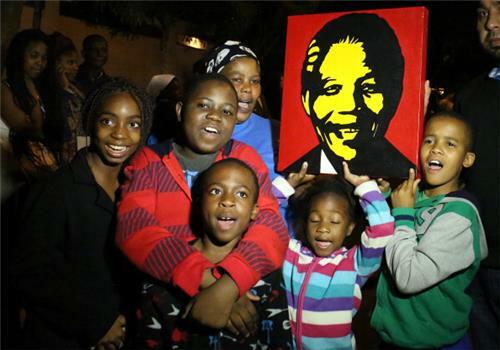 "People got emotional, some cried, and everyone started talking about Mandela," he added. "I feel very sad. I feel overwhelmed with emotion. He has done so much for us." Actor Morgan Freeman, who got to know the charismatic Mandela in the 1990s and portrayed him in the 2009 drama "Invictus," said he was "a saint to many, a hero to all who treasure liberty, freedom and the dignity of humankind." The American actor added: "As we remember his triumphs, let us, in his memory, not just reflect on how far we've come, but on how far we have to go. Madiba may no longer be with us, but his journey continues on with me and with all of us." Dozens of African leaders stand as soundtrack plays clip of Mandela’s speech, now maintain silence in homage to an African legend. It was a gloriously clear winter's day in Johannesburg, and my ears were still ringing with the throb of the Boeing 747 engines that had flown by a few minutes before, so low it seemed below the level of the floodlights around the Ellis Park stadium. The crowd roared as the teams ran onto the field – South Africa's Springboks taking on the All Blacks of New Zealand in the 1995 World Cup rugby final. Out of the corner of my eye, I saw walking out to meet the players the tall, lean, grey-haired figure of Nelson Mandela. Unlike the suited officials around him, the South African president was wearing casual grey trousers and a green shirt. As he walked he donned a green cap, and there was an audible intake of breath from more than 60,000 people as they realized Mandela was wearing the Springbok cap and jersey, with the yellow number six on the back – the same as that of the team's captain Francois Pienaar. As he shook the hands of the players, his name was shouted from one side of the stadium, and then it swelled in volume as all took it up in a powerful rhythmic beat: "Nelson, Nelson, Nelson, Nelson." At that moment, millions watched as a country divided for decades became one. South Africans in the stadium and beyond experienced for the first time a shared sense of national pride and joy. 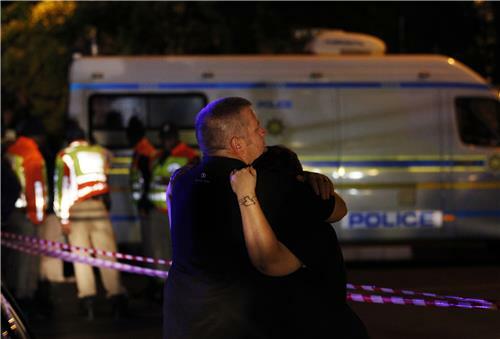 Just a year into democracy, it was the defining moment of the new South Africa. As a beaming Mandela handed over the World Cup to the blond Afrikaner captain Pienaar at the end of the game, his was the face of a man who knew his country had won far more than a sporting trophy. Mandela's decision to wear the rugby jersey was generally regarded as spontaneous, the result of one of his bodyguards contacting a team representative on the morning of the game. Yet, this exultant moment was in fact the culmination of a strategic plan that had begun decades before. The first happened speech occurred in 1963, when Mandela was tried for sabotage and conspiracy to overthrow the state. During his nearly four-hour speech in 1963 to open the trial that would ultimately lead to 27 years in prison, "Mandela laid out the plight of blacks in South Africa, but he also explained that blacks and whites had shared dreams," writes NPR's Eyder Peralta . 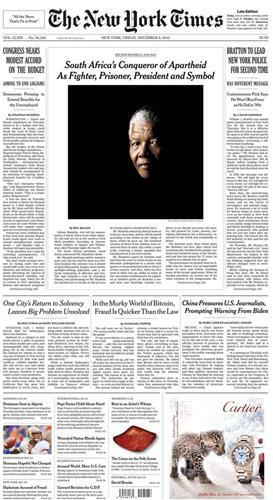 "The Times quotes Mandela's biographer as saying that the speech — "the most eloquent of his life" — established Mandela not just as a leader of the ANC, but as the leader of the "international movement against apartheid." The second is the speech Mandela gave in 1994 when he was inaugurated as the first black president of South Africa. "Instead of launching accusations at the white regime that had incarcerated him and oppressed his people for hundreds of years, he preached reconciliation," writes Peralta. Secretary of State John Kerry delivered brief remarks on the death of Nelson Mandela at Ben Gurion International Airport in Israel. Kerry invoked Mandela after several days of meetings with Israeli Prime Minister Netanyahu and Palestinian President Abbas over the Israeli-Palestinian peace process, proclaiming that "the naysayers are wrong to call peace in this region an impossible goal." We’re here this morning just outside of Tel Aviv, but our hearts are in Johannesburg with all the millions of people who loved Nelson Mandela. Madiba’s long walk to freedom gave new meaning to character and to courage, to forgiveness, and to human dignity. And now that his long walk has ended, the example that he set for all of humanity lives on. He will be remembered as a pioneer for peace, and there are some people, I think, in the course of life who truly – you meet and you are touched by them, and you’re forever changed by the experience. Nelson Mandela is one of those people. Teresa and I had the honor of sitting with Mandela over the Thanksgiving holidays of 2007, and – that and several other times. And I also stood in his tiny cell on Robben Island, a room with barely enough space to be able to lie down in or stand up in. I learned that the glare of the white rock quarry on the island permanently damaged his eyesight, and it hit home even more how remarkable it was that after spending 27 years locked up, locked away, and having his own vision impaired by that condition, that this man was still able to see the best interests of his country, the best interests of humanity, and embrace even the very guards who kept him prisoner. That is the story of a man whose ability to see resided not just in his eyes but in his conscience. He was a stranger to hate. He rejected recrimination in favor of reconciliation, and he knew the future demands required that we move beyond the place that he had been, beyond the past. So we just think of the lessons that he taught the world which have special significance at this moment in history. He said, “It always seems impossible until it is done.” I think it’s appropriate for us to think about that in the context of the work that I’ve been doing here in the last couple of days and over these last months, and of the hopes and aspirations of the people of this region. That example of Nelson Mandela is an example that we all need to take to heart as we face the challenge of trying to reach a two-state solution. Over the past two days, I had the opportunity to meet with both Prime Minister Netanyahu and President Abbas. And despite the fact that we are discussing really difficult, complicated issues, I am encouraged by the continued commitment of both leaders to the pursuit of peace. 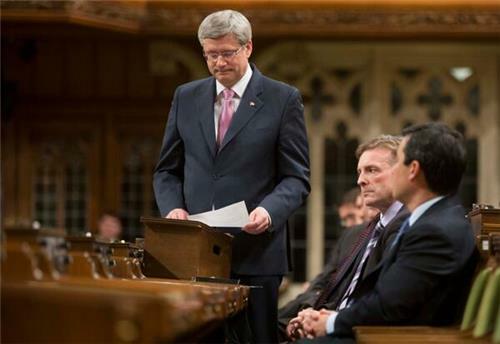 And they both underscored their commitment to continue to work through these difficult issues in the days ahead. As we look to the challenges that we face in the coming months, we need to all be not just reminded of the example of Nelson Mandela’s words, but by his actions. The naysayers are wrong to call peace in this region an impossible goal. It always seems impossible until it’s done. Since the two parties first agreed to resume talks four months ago, they have held regular discussions and the United States has remained in close contact with both sides. It hasn’t been easy; I won’t pretend that. But none of the parties embarked on this path with the expectation that it was going to be a simple or easy process. We all knew upfront that it would be a long, arduous, and complicated journey. Nonetheless, it is absolutely clear to me through the discussions that we had – and believe me, I wouldn’t spend these hours and I wouldn’t come back here given the agenda that we face on a global basis if I didn’t think it was worthwhile, if President Obama didn’t believe it was worth pursuing. And it is quite clear that both President Abbas and Prime Minister Netanyahu remain as determined as ever to continue down this path and to explore these possibilities. Because both parties have the same endpoint in their sights: Two nations for two peoples living side by side in peace and prosperity. But neither peace nor prosperity are possible without security, and the United States will only support a final status agreement that makes both Israelis and Palestinians more secure than they are today. As I made clear yesterday, the commitment of the United States to Israel’s security is ironclad. It is a commitment that spans decades. It is permanent. In 1973, that commitment was the driving force behind the 32-day airlift the United States conducted to deliver military assistance to Israeli forces during the Yom Kippur War. More than 20 years ago, that commitment was the reason we began work with Israel to develop ballistic missile defense technologies that continue to protect the Israeli people from the range of threats that they face every day. And at this moment, our commitment to Israel’s security – a central issue as we work towards a lasting peace between the Israelis and the Palestinians, and as we work towards the creation of a viable, independent, Palestinian state. That’s why President Obama and I have been working very closely with General John Allen, who is one of the United States’ most experienced military leaders, and a team with him of American defense experts – so that we can anticipate all of the threats to Israel’s security at every step of the final status negotiations process and work out ways to address those threats as well as to address the complicated questions of security within a new state of Palestine and to deal with the issues of a viable independent Palestinian state and the security challenges that that presents. Together, there is no doubt in my mind we can reach an agreement that will support the peaceful and promising Palestine that the Palestinian people deserve alongside a prosperous and a more secure Israel. There’s another issue at the heart of Israel’s security that’s also been a key focus of all of our discussions, and that is the P5+1 negotiations with respect to Iran. Throughout these negotiations, our commitment to Israel’s security is paramount. The fact remains that both the United States and Israel have the same priority with respect to Iran. We are laser-focused on preventing the Iranians from acquiring a nuclear weapon. The United States firmly believes that the P5+1 first-step agreement not only makes Israel more secure than it was the day before that agreement, but we believe it will take us closer to a lasting, peaceful, and comprehensive solution to the Iranian nuclear program. It is the best opportunity we have to resolve the international community’s concerns about Iran’s nuclear program. I pledge this, as President Obama has: As we proceed forward in this negotiation, we will continue to consult very closely with Israel as the negotiations resume as well as with our other friends and allies in the region and around the world, because that input is critical to us in the process. And as is known, Security Advisor to Prime Minister Netanyahu Yossi Cohen will travel to the United States next week. We will be engaging in very direct conversations so that we are on the same track going forward. I look forward to speaking in greater detail about the United States partnership with Israel tomorrow when I address the Saban Forum in Washington, D.C.
For now, let me just now reiterate how grateful I am for the courage that both Prime Minister Netanyahu and President Abbas both continue to display against naysayers, against opponents, as they pursue a full exploration of the possibilities of peace. I believe we are closer than we have been in years to bringing about the peace and the prosperity and the security that all of the people of this region deserve and yearn for. Read Kerry's full remarks here. 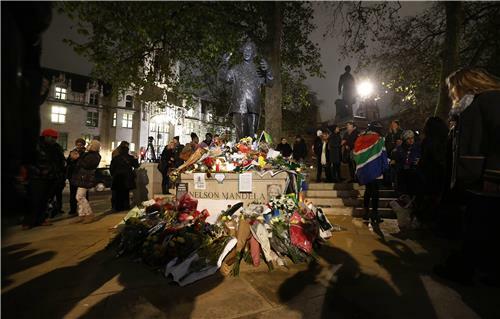 South Africans united in mourning for Nelson Mandela on Friday, but while some celebrated his remarkable life with dance and song, others fretted that the anti-apartheid hero's death would make the nation vulnerable again to racial and social tensions. South Africans had heard from President Jacob Zuma late on Thursday that the statesman and Nobel Peace Prize laureate died peacefully at his Johannesburg home in the company of his family after a long illness. On Friday, the country's 52 million people absorbed the news that their most revered statesman, a global symbol of reconciliation and peaceful co-existence, had departed forever. Zuma also announced the former president would be honoured with a December 10 memorial service at Johannesburg's Soccer City stadium - the site of the 2010 World Cup final. "We will spend the week mourning his passing. 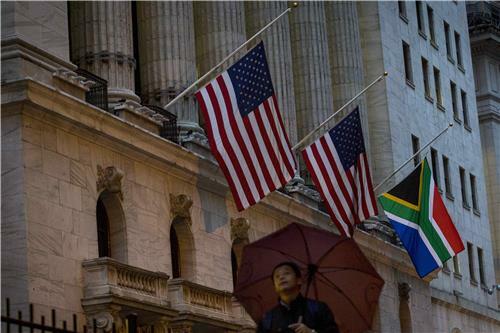 We will also spend it celebrating a life well lived," Zuma said. There is a saying in Soweto that when it rains, the old people will pass and something momentous will happen. And it did indeed rain the week before the man many call "Tata,'' or father, closed his eyes for the final time. But late on Friday, the day after the news of Mandela's death was announced, the gray skies held back their rain, and the people who loved Mandela came here, to this township at the heart of the liberation movement, to the brick house on Vilikazi Street where Nelson Mandela lived as a young lawyer and firebrand activist. They came to mourn in the best way they know how: singing, dancing, cellphones snapping pictures.That people might sing and dance to show respect for the dead may seem incongruous, but it has a long a history during the struggle against apartheid. Severe restrictions had been placed on political activity and gatherings, as such the funerals of slain political activists became de facto rallies with comrades—a term referring to activists who joined the struggle against apartheid—moving in a dance-marching hybrid called toyi-toyi. Members of the African National Congress toyi-toyi'd up and down Vilikazi street, singing songs like “Mandela bekakhona emzabalezweni “[Mandela was there during the struggle]. Occasionally, someone would begin the call and response so well-known from the struggle, and still used today at ANC rallies. 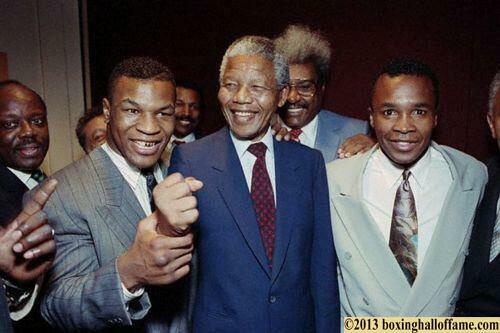 Saddened by the passing of Nelson Mandela. The legacy of his fight for justice and equality will live on for generations to come. 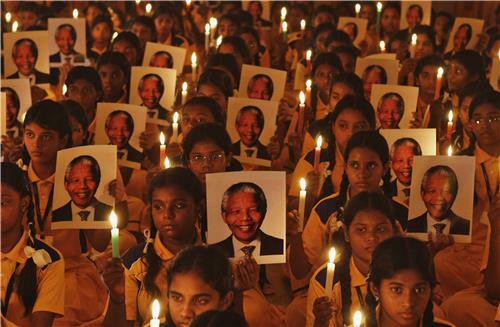 Since Nelson Mandela died, a number of people have asserted that his genius saved South Africa from civil war. This is probably true — just not necessarily for the reasons we think. Mandela was neither an original thinker nor an especially good governor. 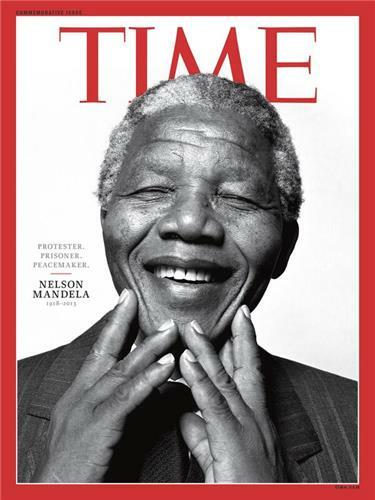 But he managed to redefine what freedom meant to South Africans, and in a way no-one else could have. Mandela did not invent the idea that South Africans ought to reconcile, as Tony Karon has rightly argued. Nine years before Mandela’s birth, in 1909, a delegation of black South Africans set off for London to protest the coming Union of South Africa, in which political representation would be confined to whites. Among them was John Dube, who would become the first president of the African National Congress, the organization Mandela himself would one day lead. Dube and his colleagues had a simple message: We are all the Queen’s subjects; we are a part of her Commonwealth; we require political representation, too. Brazilian President Dilma Rousseff will travel to South Africa to attend the funeral of late leader Nelson Mandela next week, her office said Friday. Her government also decreed seven days of national mourning in honor of Mandela, who passed away at his home in Johannesburg on Thursday at the age of 95. Rousseff will join other world leaders, including President Barack Obama, and well-known personalities who were close to the statesman like Oprah Winfrey and Bill and Hillary Clinton, at the state funeral scheduled for December 15 in Pretoria. The gathering will be one of the largest in South Africa since Mandela was inaugurated as its first black president in 1994. Bill Clinton will be attending Mandela events in South Africa as well, a spokesman said. 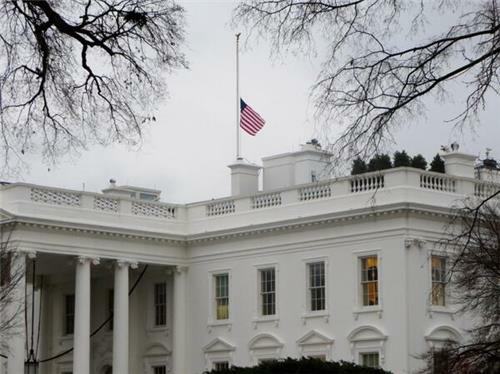 President Obama and George W. Bush will also be attending. 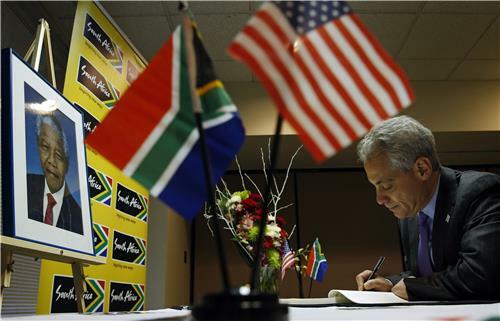 It is a sign of Mandela's importance as a world leader that the United States will be represented in South Africa by three American presidents. The exact schedules of Obama, Bush and Clinton were as yet unclear and it was not known whether Obama would make public remarks in South Africa. Maya Angelou, who first met Nelson Mandela in the early 1960s, praised him as a great man worthy of comparison to another icon she knew, the Rev. Martin Luther King Jr.
"Our planet has lost a friend," the author and poet said Friday during a telephone interview. Angelou was a journalist in Egypt, living with South African activist Vusumzi Make, when Mandela visited them. She remembered him as handsome and funny and unusually generous with compliments, able to get along with the varying groups of political opponents to South Africa's apartheid regime. Mandela was imprisoned in 1964, but their friendship resumed in the 1990s after his release, she said. "He was kind to everybody," she said. Angelou learned of Mandela's death Thursday just hours after she heard of another friend's passing. "This is a very heavy time," she said sadly during her phone interview. "A giant has fallen." 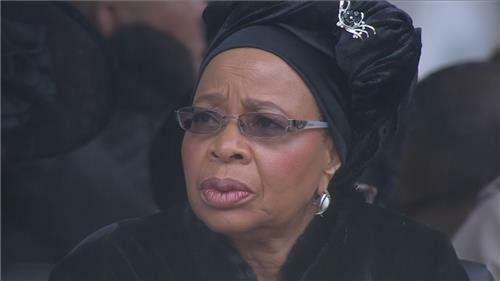 That hug between between Graca and Winnie. That will stay with me. Did you see it? The choir are leading the crowd in singing "Siyabonga Mandela" which means "Thank you Mandela"
South African President Jacob Zuma walks onto pitch for #Mandela memorial. Crowd cheers, calls out his last name. After the cheering for South African President Jacob Zuma, the crowd filled with ANC colors began booing him at the #Mandela memorial. The stadium is continuing to fill in South Africa, as both foreign and domestic dignitaries keep arriving. #Mandela memorial begins with a beautiful rendition of the South African national anthem. The memorial service has officially begun. 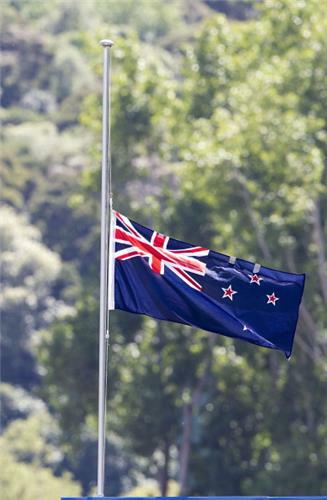 The service started with a beautiful rendition of the country's national anthem. 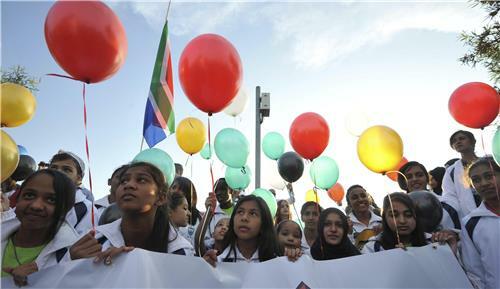 Crowds then cheered 'long live' Nelson Mandela. Cyril Ramaphosa was the first speaker. He apologized for the rain but said this is how Nelson Mandela would have wanted it, saying the rain was a blessing. 'This occasion should make all of us to pause today and reflect on the life of Nelson Mandela," Ramaphosa said, adding that the ceremony should give everyone cause to gather their memories of Mandela. "With the weight of burden on his shoulders, he worked to free us all," Ramaphosa said of Mandela. "He was our teacher and our mentor." Following Ramaphosa's speech, he asked for the ceremony to start with an opening prayer. Obama motorcade now making its way to the FNB stadium. 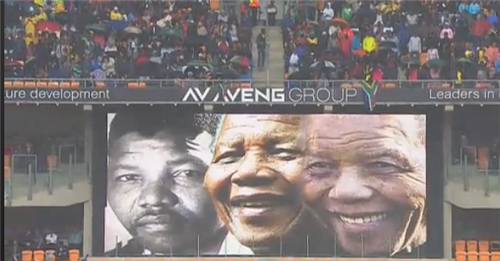 Crowd at FNB Stadium now sings for "Tata Mandiba" at #Mandela memorial. Cyril Ramaphosa admonishing the crowd at #Mandela memorial to be quiet: ""Let us send him off with greater discipline." The crowd is getting a bit out of control in South Africa. Attendees in the stands are playing loud music, cheering, and generally making quite a bit of noise in the stands. Cyril Ramaphosa has had to ask the crowd for greater control multiple times. "You will play your wonderful music in a little while," he said, while assuring the crowd there are only three more speakers. "So put the music down. Let the president of India continue, please." Celebrating one of his personal heroes, President Barack Obama praised Nelson Mandela as the last great liberator of the 20th century, urging the world to carry on his legacy by fighting inequality, poverty and discrimination. At a memorial service in Johannesburg, Obama compared the former South African President to Mahatma Gandhi, Martin Luther King Jr. and Abraham Lincoln. He said Mandela had earned his place in history through struggle, shrewdness, persistence and faith. "For nothing he achieved was inevitable," Obama said. "In the arc of his life, we see a man who earned his place in history through struggle and shrewdness, persistence and faith. He tells us what's possible not just in the pages of dusty history books, but in our own lives as well." In a rain-soaked stadium where world leaders gathered to honor the anti-apartheid leader, Obama traced the influence that Mandela's story has had on his own life, disclosing that he asks himself how well he's applied Mandela's lessons to himself as a man and as president. He said in the U.S., South Africa and around the world, people must not allow progress that's been made to cloud the fact that more work must be done. 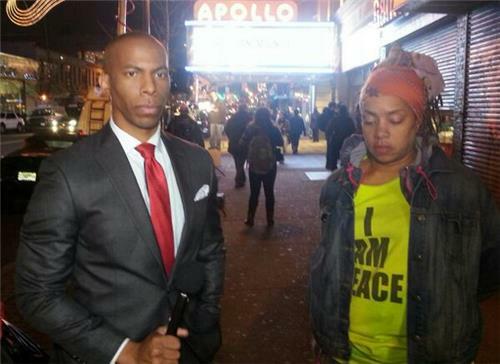 "We, too, must act on behalf of justice. We, too, must act on behalf of peace. There are too many of us who happily embrace Madiba's legacy of racial reconciliation, but passionately resist even modest reforms that would challenge chronic poverty and growing inequality," Obama said, referring to Mandela by his traditional clan name. Joining Obama on the 16-hour trip from Washington for the ceremony were first lady Michelle Obama, former President George W. Bush and his wife, Laura, and former Secretary of State Hillary Rodham Clinton. Former Presidents Bill Clinton and Jimmy Carter also attended the memorial service. Cuba's Raul Castro also delivered a speech in Mandela's honor. As The Associated Press' Julie Pace pointed out, it is a rare event when a Cuban leader and an American one speak at the same event. During his speech, Castro highlighted the fact that Cubans has fought alongside Africans. Crowds dwindled a bit ahead of South African President Jacob Zuma's speech at #Mandela memorial. What will he say after being booed? The sign language interpreter at Nelson Mandela's memorial accused of being a fake has told The Associated Press he was hallucinating during the ceremony. The man accused of faking sign-language while standing alongside world leaders like U.S. President Barack Obama at Nelson Mandela's memorial service said Thursday he saw "angels" at the event, has been violent in the past and suffers from schizophrenia. Jantjie, who stood gesticulating 3 feet (1 meter) from Obama and others who spoke at Tuesday's ceremony that was broadcast around the world, insisted that he was doing proper sign-language interpretation of the speeches of world leaders. "I would like to tell everybody that if I've offended anyone, please, forgive me," Jantjie said in his concrete home in a low-income Johannesburg neighborhood. "But what I was doing, I was doing what I believe is my calling, I was doing what I believe makes a difference." Read more at the AP. The Associated Press then reported later Thursday morning that a South African Cabinet minister admitted to making a mistake in hiring the man to act as an interpreter for the memorial.